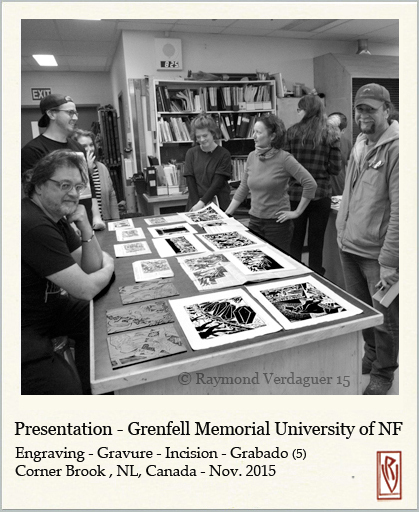 Monday November 9, 2015: Presentation – lecture of a series of my original linoleum cut prints commissioned by The New York Times, at the printing studio of the Grenfell Campus, Memorial University of Newfoundland, Corner Brook, Canada. 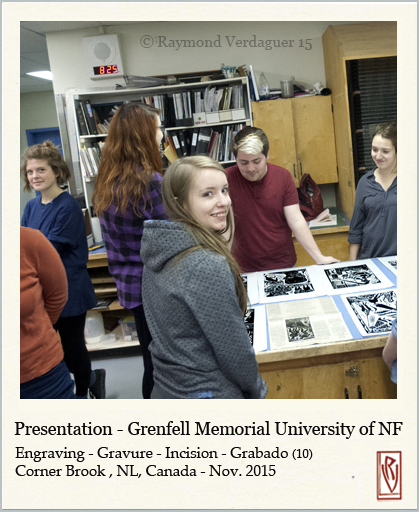 Unlike many workshops I have visited, upon entering the the printshop studio of Grenfell Campus (Memorial University of Newfoundland, Corner Brook, NL, Canada), one can sense that someone has planned well for the maintenance of a spotless place. Printmaking is by definition messy, so space management tends to get out of control; add to the fact that one gets tired after a day of printing. For example, cleaning stick printing ink with solvents can take the fun out of the process for someone. In this clean, welcoming environment, I laid my original linocut prints (commissioned by the New York Times) and their publication in the newspaper, on large tables. This allowed the viewer to look at the relation and difference between the original art work and its final reproduction in the paper. 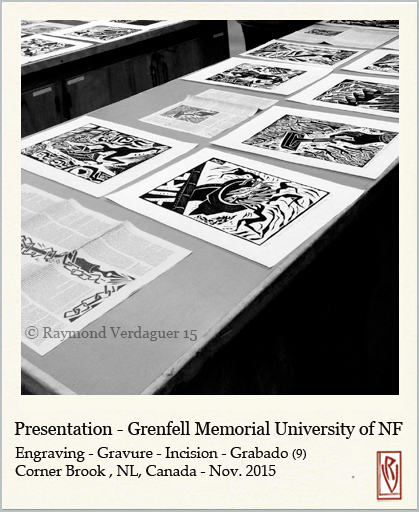 Most printmakers artists do NOT have their work reproduced, and fewer still, have their work reproduced in newspapers, magazines, books. 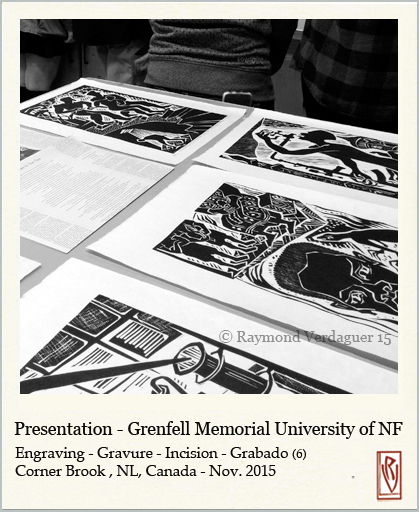 I undertook such direction in order to present my work to a wider audience, which I consider to be a more democratic approach than the restricted ‘art for a collector’s elite’ viewing. And yet, I recognize this approach has its advantages and drawbacks. One drawback is that the reproduced image from an original work takes without exception the punishment the process implies. For this reason I have chosen to express myself via the linoleum cut and woodcut which handle such punishment better. In gaining experience with this process, one also comes to realize the importance of ‘simplifying’ while never becoming ‘simplistic’ in order to ensure the best results. For example, some shapes and forms of detailing may get visually lost and therefore it is best that one learns to avoid using them. Presenting these two distinct ‘images’ allows one to step into the world of ‘illustration’ – a word that I have always disliked because since it’s promising beginning with the Daumier’s, Lautrec’s and alike, it has become a catch phrase for ‘everything ‘ and ‘nothing’. 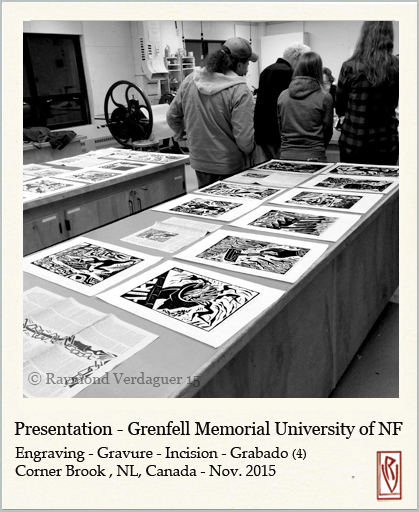 While in my presentation at Grenfell I shared my experience and perspective on printmaking, my central focus was to outline the process, from start to finish, of being commissioned to do an ‘art work’ to be reproduced and become public, in ‘hard copy’ as well as on the internet. I also highlighted the importance of considering the ‘ethics’ of the image that one creates for public view on a large scale. Like any action, ‘image creation’ raises issues of ‘responsibility’. Being an ‘artist’ cannot come without a sense of conscience – an issue I raise in my presentations long before the tragic events of the Charlie’s [ Paris 2015] publications. 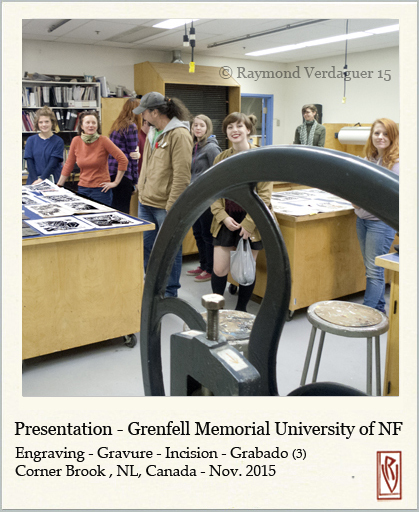 My gratitude to Marlene MacCallum and the Visual Arts Program at Grenfell Campus, Memorial University of Newfoundland, NL, Canada, for their generous invitation to present my work.